Barbie looks different this morning: Mattel just rolled out variations of its iconic doll in three new body types, part of a project that re-envisions the brand as more modern and diverse. But will it be enough to put her back on top? Barbie has been defending herself against feminist criticism for almost as long as she’s existed, and in recent years the conflict has come to a head, with many attributing slumping sales at least in part to moms’ concerns about the messages sent by the plastic princess of the toy aisle. Time reports from Mattel HQ, where they have launched the retail equivalent of D-Day, an attempt to reposition the doll for an America that’s less accepting of the idea that women should fit some anatomically impossible physical ideal left over from the 1950s. Mattel will sell the dolls exclusively on Barbie.com at first while it negotiates with retailers for extra shelf space to make room for the new bodies and their clothes alongside the original. There are a seemingly infinite number of combinations of hair texture, hair cut and color, body type and skin tone. And then there’s the issue of how to package the dolls. Mothers surveyed in Mattel focus groups expressed concern over giving the new dolls to their daughter or a friend of their daughter’s. What if a sensitive mom reads into the gift of a curvy doll a comment on her daughter’s weight? 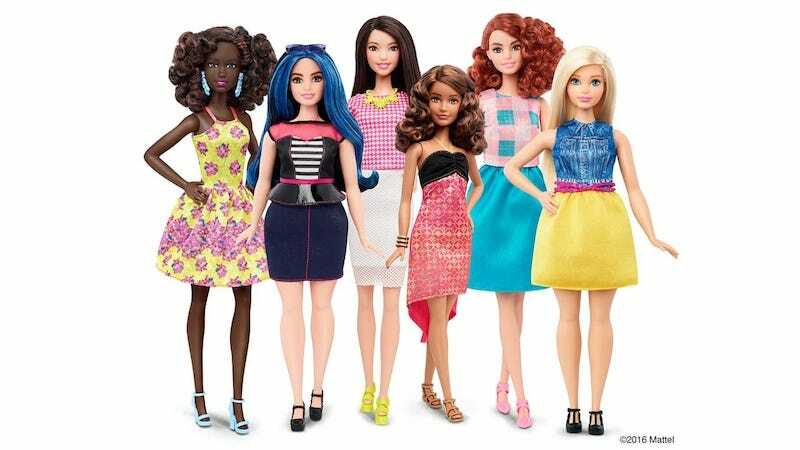 Mattel decided to sell the dolls in sets to avoid this problem, but then it had to figure out which dolls to sell together to optimize diversity and marketability. It’s unquestionably positive for girls to see a wider array of skin colors and body types represented positively. A more diverse Barbie is a good thing. But it’s impossible to separate my personal response to this development from the fact that I was a Barbie-loving chubby child, and—as Time alludes to—my reaction to being singled out with a gift of the “curvy” Barbie might very well have been absolute devastation. Like every girl who has ever played with the most popular toy in history, I yank her clothes off and try to put on a new dress. It’s a blue summery frock, cinched tightly at the waist with a black ribbon. I try to tug it over her head, but the waistline gets stuck at her shoulders, her blond mane peeking out from the neckline. “Try going feet first,” the lead designer suggests, and I do. No good. Her plump bottom gets stuck in the same spot.